Interest in cellulose degrading enzymes has increased in recent years due to the expansion of the cellulosic biofuel industry. The rumen is a highly adapted environment for the degradation of cellulose and a promising source of enzymes for industrial use. To identify cellulase enzymes that may be of such use we have undertaken a functional metagenomic screen to identify cellulase enzymes from the bacterial community in the rumen of a grass-hay fed dairy cow. Twenty five clones specifying cellulose activity were identified. Subcloning and sequence analysis of a subset of these hydrolase-positive clones identified 10 endoglucanase genes. Preliminary characterization of the encoded cellulases was carried out using crude extracts of each of the subclones. Zymogram analysis using carboxymethylcellulose as a substrate showed a single positive band for each subclone, confirming that only one functional cellulase gene was present in each. One cellulase gene, designated Cel14b22, was expressed at a high level in Escherichia coli and purified for further characterization. The purified recombinant enzyme showed optimal activity at pH 6.0 and 50°C. It was stable over a broad pH range, from pH 4.0 to 10.0. The activity was significantly enhanced by Mn2+ and dramatically reduced by Fe3+ or Cu2+. The enzyme hydrolyzed a wide range of beta-1,3-, and beta-1,4-linked polysaccharides, with varying activities. Activities toward microcrystalline cellulose and filter paper were relatively high, while the highest activity was toward Oat Gum. The present study shows that a functional metagenomic approach can be used to isolate previously uncharacterized cellulases from the rumen environment. Cellulose is a principal component of plant cell walls. Efficient cellulose hydrolysis requires the synergistic activity of three classes of cellulase: endo-1,4-β-glucanase (EC3.2.1.4), cellobiohydrolase (EC3.2.1.91) and β-glucosidase (EC3.2.1.21). In recent years, interest in plant cell-wall-degrading enzymes, including cellulases, has increased due to the numerous potential industrial applications of these enzymes. They have been widely applied in the textile and laundry, food and feed, pulp and paper, baking, waste treatment, and biomass-based alcohol production industries. Growing concerns about the worldwide shortage of non-renewable fuel and rising oil prices as well as greenhouse gas emissions have led to an increasing interest in the development of alternative environmentally-friendly biofuels. Cellulases are produced by a variety of organisms, including archaea, prokaryotes, fungi, plants, and animals. The most effective known natural systems for rapid biomass conversion, however, involve complex communities of microorganisms, primarily prokaryotes and fungi, maintained in a symbiotic relationship with an animal host. This apparent need for complexity is a consequence of the biochemical intricacy of the biomass that serves as the fermentation substrate, a complex, physically and chemically linked mixture of cellulose, hemicellulose, xylan, waxes, and lignins. Perhaps one of the best characterized examples of an effective complex biomass degrading community is that harboured within the rumen. The natural diet of ruminants is mainly plant material, and most of the digestion of plant mass takes place under anaerobic conditions within the rumen. Many hydrolase genes have been isolated and characterized from cultivable ruminal microbes however, it is generally accepted that a large proportion of the microorganisms in many complex natural environments remain uncultured[6, 7]. Even for the relatively intensively studied rumen microbial community it is estimated that more than 85% of its members have still not been cultivated. This estimate is based on the phylogenetic diversity of rumen microbial communities in deer, sheep and cattle as revealed by 16S/18S rDNA amplification sequencing techniques, denaturing gradient gel electrophoresis, terminal restriction fragment length polymorphism, and suppressive subtractive hybridization methods[8–12]. This unexplored microbial diversity represents an untapped source of potentially novel and unique enzymatic activities and metabolic pathways that can be applied to industrial biomass conversion[7, 13, 14]. Metagenomic approaches have been widely used to isolate novel biocatalysts from environmental samples. Several metagenome derived hydrolase genes have been identified in metagenomic libraries prepared from various environmental samples, including those from the rumen[14, 16–19]. The goals of this study were to clone and characterize novel cellulases from the rumen microbial community. To this end, a functional screen of a bacterial artificial chromosome (BAC) metagenomic library from the cow rumen was implemented to identify proteins involved in the degradation of polysaccharides by uncultivated rumen microorganisms. A metagenomic BAC library of ~6000 clones was constructed with high molecular weight DNA isolated by a freeze grinding technique from dairy cow rumen samples. Screening for hydrolase activities resulted in the identification of ten independent clones expressing carboxymethyl cellulase (CMCase) activities, nine expressing β-glucosidase activities and seven expressing hydrolase activities for other substrates were isolated (Table1). The total library encompassed an estimated 900 Mb of insertion DNA. The positive rate of hydrolase activity in the library was approximately 0.15% of examined clones, or one expressed hydrolase gene per 10 Mb of insert DNA. Subcloning and sequence analysis of a subset of these hydrolase-positive clones identified twenty endoglucanase genes (Table1). Predicted amino acid sequences generally indicated moderate to low homology and similarity (average 70%) to the cellulases in NCBI databases. Ten endoglucanases with CMCase activity were selected for further study. Glycoside hydrolase families 5, 8 and 9 were represented by six, one, and three of these ten endoglucanases, respectively (Table1). On the basis of a CMCase zymogram with native PAGE, each of the subclones selected for further study appeared to produce only a single active protein which was responsible for the observed activity, except for p35 where no positive band was observed (Figure1). The CMCase activity of the 10 cellulases was assayed over a range of pH values and temperatures. The pH optima ranged from 6 to 7, while the optimal temperatures for all were between 40 to 50°C (Table2). All the cellulases were also tested for their substrate specificities (Table3). The CMCases showed a diverse range of activity with six showing maximal activity toward oat gum, one toward barley glucan, two toward CMC, and one toward lichenan. The activity of these enzymes towards methyl cellulose, filter paper, Avicel, and xylan from birch wood or oat spelt ranged widely. Among the subcloness, p2 and p13 (BAC clones 6-C02 and 14-B22) showed the highest activities towards Avicel and filter paper of the CMCases examined. Zymogram analysis of the 10 cloned cellulases in native polyacrylamide gel eletrophoresis. CMCase activities were detected on CMC agar replica plates of the polycrylamide gel. Due to the high activity against crystalline cellulose the cellulases, encoded in subclones p2 and p13 were selected for further study. The genes, designated by the names of the original BAC clones as C6c02 and Cel14b22, had lengths of 1680 bp, encoding for 559 amino acids, and 2679 bp, encoding for 892 amino acids, respectively. SMART analysis of deduced amino acid sequences of the C6c02 and Cel14b22 cellulase genes showed that each contained a glycosyl hydrolase (GH) family 5 catalytic domain and a signal peptide. The C6c02 contained a CBM_II, but Cel14b22 contained a C-terminal module with no significant homology to known CBMs. Unfortunately, despite our best efforts the overexpressed product of C6c02 was insoluble and could not be purified. 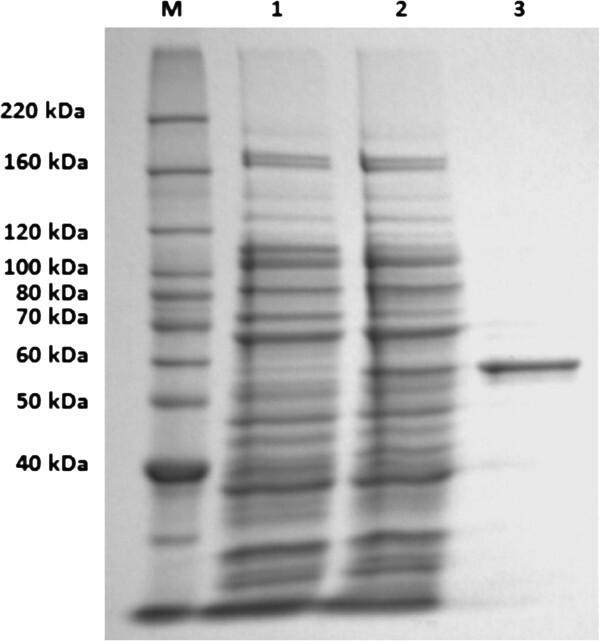 SDS-PAGE analysis of the crude extract of Cel14b22 showed expression of 6xHis tagged proteins, as observed by the appearance of an extra protein band migrating at about 63 kDa upon induction (Figure2, lane 2). The size of the expressed Cel14b22 was similar to the molecular mass calculated from the amino acid sequences (63 kDa). After purification with the Ni-NTA column and desalting with PD-10 columns, a single band was shown on the SDS-PAGE gel corresponding with the size of the enzyme, suggesting that the enzyme was purified to homogeneity (Figure2, lane 3). Sodium dodecyl sulfate polyacrylamide gel electrophoresis (SDS-PAGE) analysis of recombinant Cel14b22 protein stained with Coomassie blue. Lane M: protein molecular weight marker. Lane 1: Crude extract before IPTG induction. Lane 2: Crude extract after IPTG induction. Lane 3: Purified Cel14b22. The activity of Cel14b22 towards CMC was optimal at a ~ pH 6.0 and 50°C, consistent with the optimal conditions for the crude protein extract from subclone p13. The Cel14b22 enzyme retained more than 60% of its activity after storage at 4°C for 24 h at pHs ranging from 4 to 10 (Figure3 a,b). The enzyme was stable for 1 h at temperatures below 50°C with over 80% of the activity remaining, but activity was completely lost at temperatures above 55°C (Figure3 c,d). The K m and Vmax of the recombinant Cel14b22 towards CMC were 13.23 mg/mL and 178.57 U/mg, respectively. Effects of pH and temperature on the activity and the stability of Cel14b22. a) Effect of pH on activity of Cel14b22. b) pH stability of Cel14b22. c) Effect of temperature on the activity of Cel14b22. d) Temperature stability of Cel14b22. The error bars represent the standard deviation of triplicate measurements. Substrate specificity of the recombinant Cel14b22 was determined under optimal conditions with 1% polysaccharides (Table4). The enzyme had the highest activities towards barley oat gum, and showed low activity toward insoluble celluloses. a The incubation time for activity measurement was 15 min, performed in triplicate and the standard deviations were calculated. The effects of metal ions, EDTA, and SDS on CMCase activity were also determined. Mn2+ enhanced the enzymatic activity to 155%, whereas Cu2+ and Fe3+ dramatically reduced enzyme activity, to 21% and 12%, respectively. Cr2+, Zn2+ and Mg2+ had only slight inhibitory effects, and Co2+, Ca2+, K+ and Na+ did not alter activity. The chelating agent EDTA slightly inhibited activity (to 84%), whereas SDS completely abolished the activity of Cel14b22 (Table5). This study was in part undertaken to assess the utility of a freeze grinding approach to the recovery of representative, high molecular weight, metagenomic DNA from the rumen microbial community and to identify cellulases that may be of industrial interest. This approach had a particular focus on the quantitative recovery of DNA from the largely fibre-associated members of the rumen microbial community involved in plant fibre degradation. The test BAC library comprised ~6000 clones constructed with high molecular weight DNA isolated by a freeze grinding technique from dairy cow rumen samples. The total library encompassed an estimated 900 Mb of insertion DNA. The positive rate of hydrolase activity expression in the library was approximately 0.15% of the tested clones, or one expressed hydrolase gene per 10 Mb of insert DNA. For polysaccharidases, the rate was about 1 hydrolase gene per 25 Mb of insert DNA. This rate is very similar to that which would be expected from the data of Brulc et al., who used a pyrosequencing approach, where examination of ~25 000 Mb of sequence data identified ~1000 GH family sequences. This result suggests that the freeze grinding approach indeed provides a representative sample of the rumen metagenome while facilitating a functional screening approach. We identified twenty five cellulase positive BAC clones (inluding nine β-glucosidases). The high number of hydrolytic clones is consistent with the adaptation of the rumen microbial community for the digestion of plant cell-wall material in the rumen[16, 17]. However, cellobiohydrolases or multi-domain cellulases were not retrieved in this study, most likely because that they did fold appropriately in host E. coli, were not expressed, or their expression level was too low to be detected. However, pyrosequencing of BAC clones expressing hydrolase activities does allow the identification of clustered genes which might be functionally related to the expressed activity. This is apparent in BAC clone 3-N18, where genes for a xylanase, esterase and 3 putative glycoside hydrolases grouped together. BAC clones that show homologies to Fibrobacter succinogenes, a prominent cellulolytic bacterium in the rumen, do not exhibit this pattern, as has been noted in the F. succinogenes genome sequence. The recombinant enzyme Cel14b22 was over-expressed and purified. It comprises an N-terminal signal peptide (amino acids 1–19), a catalytic module belonging to the glycoside hydrolase family 5 (amino acids 40–339), and a C-terminal module with no known functional homologue. The conserved catalytic residues were identified by homology to other GH5 family members as the Glu 178 and Glu 289 residues. As with the two catalytic residues, the other six well-established conserved residues in the GH5 family were also verified in the Cel14b22 sequence: Arg 83, His 125, Asn 177, His 253, Tyr 255 and Trp 331. Studies suggested that these eight residues are conserved in all GH5 family enzymes[21, 22]. The C-terminal module (amino acids 340–559) showed no significant homology to known CBMs, but it shared 28% identity with the C-terminal module of another GH5 cellulase, ACA61140. This GH5 family cellulase, from another uncultured ruminal microorganism, also shows no significant homology to known CBMs. Almost all CBMs studied to date contain surface exposed aromatic rings, which have been shown to be involved in the recognition and binding of polysaccharides. Aromatic amino acid residues form face-to-face hydrophobic stacking interactions in which a tryptophan or tyrosine ring interacts with the nonpolar face of a sugar ring. An alignment of the module with a xylanase/cellulase from the ruminal bacterium Prevotella ruminicola 23 (1923215A, aa 375–584), uncultured ruminal microbial cellulases ACA61137 (aa 334–546) and ACA61140 (aa 334-537aa), and uncultured ruminal bifunctional/cellulase enzymes ABB46200 (aa 715–917) and ADA62505 (aa 721–919) showed that nine aromatic amino acid residues were conserved in the sequences (Figure4) with the two tryptophan residues possibly involved in cellulose binding. The observation that Cel14b22 has activity towards Avicel and filter paper also suggests that the C-terminal module has CBM activity. 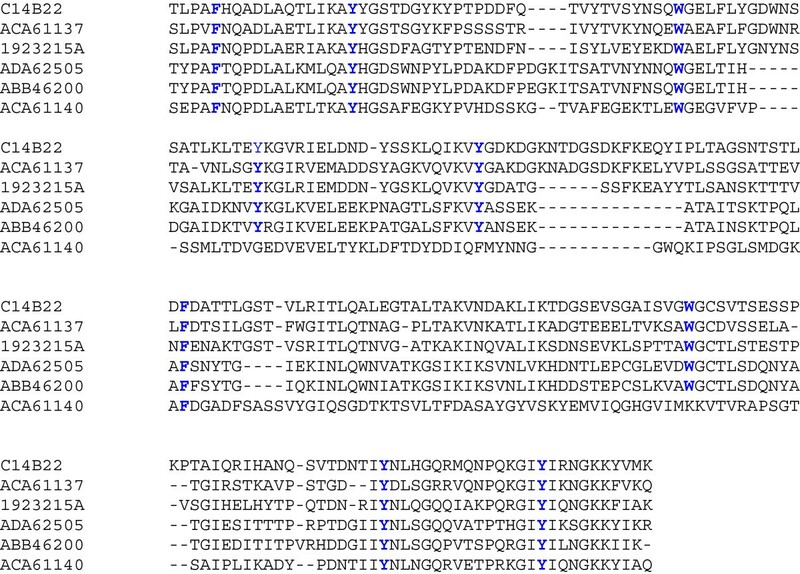 Multiple sequence alignment of C-terminal module (amino acids 340–559) of Cel14b22 with xylanase/cellulase (1923215A, 375-584aa) from the ruminal bacterium Prevotella ruminicola 23 and uncultured ruminal microbial cellulases (ACA61137, aa 334–546; ACA61140, aa 334–537; ABB46200, aa 715–917; ADA 62505, aa 721–919). The nine conserved aromatic amino acid residues among homologous C-terminal modules are highlighted in bold and blue. Cel14b22 shares physico-chemical properties with many other family 5 endoglucanases. Several cellulases from fungi and bacteria[27, 28] show optimal hydrolytic activities under similar conditions. Cel14b22 is active over a wide range of pH, retaining 40% of its activity between pH 4.5 and pH 9.5, and it is stable even at pH 10.0.The Cel14b22 endoglucanase was only partially inhibited when incubated in 1 mM EDTA, suggesting that Cel14b22 does not absolutely require divalent cations to degrade CMC. Furthermore, addition of 10 mm Ca2+ or Co2+ to the incubation buffer did not alter Cel14b22 activity. This is the case for the majority of glycoside hydrolases from family 5, whereas these cations seem to stimulate several family 9 glycoside hydrolases[29, 30]. The metal ion Mn2+ did enhance enzyme activity, which is consistent with most cellulases[31–33]. It is known that different metallic ions, such as Fe3+, Cu2+, Zn3+, exert an inhibitory effect on family 5 glycoside hydrolases[30, 34], especially those from ruminal cellulolytic bacteria. This was also observed with Cel14b22 with Zn3+, Cu2+ and Fe3+. The activity of Cel14b22 was significantly higher toward mixed-linkage β-glucans from barley and oats than toward (1,4)-β-glucans, including CMC. Activity was also lower toward the mixed-linkage β-glucan lichenan, perhaps due to the higher proportion of β-(1,3)-linkages in this polysaccharide. The Cel14b22 product could also hydrolyse birchwood xylan and oat-spelt xylan, but had limited activity toward microcrystalline cellulose and filter paper, which are largely resistant to hydrolysis by many of the previously characterized GH 5 glucanases[30, 35] including the metagenome-derived endoglucanase Cel5A. The broad substrate specificity of Cel14b22 is consistent with previous reports on cellulases from other glucanase families[36–41]. Although the enzyme shows considerable homology (66%) with another uncultured ruminal microbial cellulase, its enzymatic characteristics are quite different. Our study confirmed the utility of a freeze grinding method for the isolation from a complex microbial community of high molecular weight metagenomic DNA for use in the construction of BAC libraries. Such libraries allow functional screening for the isolation of novel hydrolytic enzymes and facilitate the analysis of gene clusters containing functionally related genes that may or may not be expressed in the heterologous host. In addition we identified and characterized a novel family 5 glycoside hydrolase with significant activity towards a variety of β-1,4- and β-(1,3-1,4) glucans, including microcrystalline and filter paper celluloses, and β-1,4-xylans. Rumen contents (mixed solids and liquid) were sampled from a rumen cannulated dairy cow maintained on a grass/hay diet. The samples (~15 g) were centrifuged (19 200 × g, 10 min), and the pellet suspended in 30 mL of 100 mM Tris–HCl pH 8.0, 500 mM EDTA pH 8.0, 1.5 M NaCl, 1 mg/mL Proteinase K and rapidly frozen in liquid nitrogen. Frozen samples were pulverized in a Retsch RM 100 Mortar Grinder (F. Kurt Retsch GmbH and Co., Haan, Germany) and ground in the presence of liquid nitrogen for 5 min. Following grinding, samples were incubated in a water bath at 50°C for 40 min, combined with 3 mL 2% SDS and incubated at 65°C for another 45 min. The lysate was centrifuged at 19 200 × g for 10 min at room temperature to pellet debris and the supernatant was combined 1:1 (v/v) with warm (65°C) 2% agarose (w/v in distilled water) by gentle inversion. This mixture was poured into 90 mm square petri plates to a depth of 5–6 mm thickness and allowed to solidify at room temperature. The agarose containing the embedded DNA was then cut into 5 mm strips and the strips were equilibrated 3 times over 24 h against 30 volumes of TE buffer (10 mM Tris.HCl, 1 mM EDTA, pH 8.0) and stored at 4°C. Low molecular weight DNA (< 25Kb) was removed by a single fractionation by field inversion gel electrophoresis in 1% agarose and 0.5× TBE using a Hoefer PC750 pulse controller (Hoefer Scientific Instruments, San Francisco, CA, USA) set at 3 s forward, 1 s reverse with a 0.5×/h increasing time ramp, run at 4 V.cm-1 for 16 h at 4°C. Fragments of DNA larger than 50 Kb were concentrated by electrophoresis at a constant 4 V/cm onto a piece of 6 000–8 000 Da cutoff dialysis membrane secured in the gel at the 50 Kb point. After sufficient time to move all DNA to the membrane the field was reversed and the DNA run back off the membrane into the gel a distance of 2 mm. The 3 mm strip of agarose containing the concentrated high molecular weight (50 to ~ 500Kb) DNA was removed and stored in sterile TE buffer at 4°C. Agarose containing 50–500 Kb rumen metagenomic DNA was equilibrated three times for 30 min in 1 × New England BioLabs buffer 1, 1 × Bovine Serum Albumin (New England BioLabs, Pickering, ON, Canada). The agarose was then melted at 65°C for 5 min, cooled to 37°C, and Sau3A I (New England BioLabs) was added at a concentration of 0.01U/μL of agarose. The mixture was incubated at 37°C for 10 min and digestion stopped by the addition of EDTA to a final concentration of 20 mM, producing a limited partial Sau3A I digest. The partially Sau3A I-digested DNA was then further sized as described above to remove fragments less than 50 kb before being used for ligation. Agarose containing partially digested and sized metagenomic DNA was equilibrated 3 times over 24 h in 10 volumes of TE. A portion was melted, diluted two-fold and used to determine DNA concentration using a NanoDrop3300 fluorospectrometer (Thermo Scientific NanoDrop, Wilmington DE, USA). 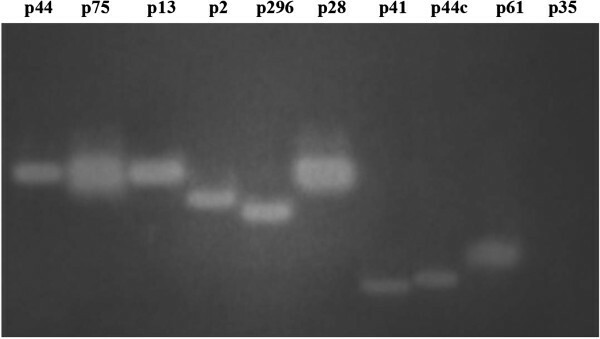 Metagenomic DNA (25–50 ng) in no more than 12.5 μL of agarose was used in ligation reactions set up according to the manufacturer’s directions using 25 ng pSMART BAC vector (Lucigen Corporation, Middleton, WI, USA) in a final volume of 50 μL. Ligation reactions (1 μL) were transformed into 20 μL of BAC-Optimized Replicator v2.0 Electrocompetent Cells (Lucigen Corporation) in a 1 mm gap cuvette using a BTX ECM 600 (BTX Harvard Apparatus, Holliston MD, USA) set with a resistance of 129 ohms and charging voltage of 1.2 kV. Positive transformants were selected on YT agar (0.8 g tryptone, 0.5 g yeast extract, 0.5 g NaCl, 1.2 g agar per 100 mL water) containing 5% sucrose and 12.5 μg/mL chloramphenicol. Positive clones were picked using a Genetix QPix (Genetix, San Jose CA, USA) into 384 well plates containing Luria-Bertani (LB) freezing medium (1.0 g tryptone, 0.5 g yeast extract, 1.0 g NaCl, 0.18 g H2PO4, 0.67 g K2HPO4, 0.05 g sodium citrate, 0.09 g (NH4)2SO4, 4.4 mL glycerol, 20 μL 5 N NaOH, per 100 mL water). After autoclaving sterile Mg SO4 was added to a final concentration of 0.4 mM containing 12.5 μg/mL chloramphenicol and clones were cultured overnight at 37°C before storing at −80°C. Cultures stored in LB freezing medium were replicated into LB with 12.5 μg/mL chloramphenicol in 384 well plates and grown overnight at 37°C. Clones were transferred from the 384 well plates onto 22 cm × 22 cm plates containing LB agar overlaid with a 1 mm deep layer of agar containing the test substrate, in a 3 × 3 macroarray grid pattern using a Genetix QPix, such that each individual clone was inoculated twice in each 3 × 3 grid. A maximum of 6912 clones were screened on each 22 cm × 22 cm plate. Polysaccharide hydrolase activities were detected using the method of Wood et al. with overlays containing carboxymethyl cellulose (CMC) (Sigma-Aldrich, Oakville, ON, Canada), oat ß glucan, lichenan (Sigma-Aldrich), or corn xylan (Sigma-Aldrich) at a 1% concentration, followed by staining with Congo red to visualize clearing zones. ß-glucosidase activity was evaluated using plates containing 0.1% esculin and 0.05% ferric ammonium citrate in the overlay and observing a black precipitate around clones positive for ß-glucosidase activity. BAC clones expressing positive cellulase activities were selected for shotgun 454 sequencing (Macrogen, Seoul, Korea). Sequence data was assembled using Mira3 after vector sequences were masked using the program Smalt (Wellcome Trust Sanger Institute, Cambridge, UK). Assembled contigs were imported into Geneious (Biomatters Ltd., Auckland, New Zealand) and open reading frames were identified using open reading frame finder (NCBI;http://www.ncbi.nlm.nih.gov) and Glimmer Sequences identities were investigated using BlastN, BlastX and BlastP (NCBI;http://www.ncbi.nlm.nih.gov) and genome comparisons were made using IMG and IMG/M. The modular structures of the enzymes were predicted by SMART online (http://smart.embl-heidelberg.de). The nucleotide sequence of the cellulase gene (Cel14b22) was deposited into the GenBank database under accession number JN98181. Subcloning was performed to localize the hydrolase genes, to shorten the inserts for effective sequencing, and to increase expression levels for biochemical characterization. Extracted BAC DNA was obtained from hydrolase-positive clones using a large and partial digest with Sau3A I. Fragments between 2 and 8 kb were extracted from agarose gel with a QIAquick Gel Extraction Kit (Qiagen, Mississauga, ON, Canada) according to the manufacturer directions and subcloned into BamH I digested, calf intestinal phosphatase dephosphorylated plasmid vector pUC19 (Invitrogen, Burlington, ON, Canada). The resulting transformants were screened for cellulase activity as described above. Ten subclones expressing different CMC hydrolases (CMCases) were identified and grown in 200-mL cultures overnight. The cells were harvested by centrifugation (8000 × g, 15 min), resuspended in 4 mL of 0.1 M sodium-phosphate buffer (pH 6.5) and lysed by sonication. Crude cell lysates were centrifuged at 10 000 × g for 20–30 min at 4°C to remove cellular debris and supernatants were used as crude protein extracts for subsequent assays. pH profiles for individual subclones was determined at 40°C by monitoring enzyme activity over a range of pHs (0.1 M citric acid-sodium citrate buffer, pH 3.0~6.0; 0.1 M sodium-phosphate buffer, pH 6.0~8.0; 0.1 M glycine-NaOH buffer, pH 8.6~10.0). Optimal activity over a temperature range of 25°C to 75°C was also determined. To analyse substrate specificities, the hydrolase activity of the protein extracts was measured after 30 min incubation at the optimal temperature in the optimal buffer containing 1% (w/v) polysaccharides. The tested polysaccharides were CMC, Avicel, lichenan, barley glucan, methyl cellulose, oat spelt xylan, birch wood xylan, oat gum, and filter paper. Reducing sugars released from the substrates were measured with 3,5-dinitrosalicylic acid as described by Miller. One unit (U) of endoglucanase activity was defined as the amount of enzyme releasing 1 μmol of reducing sugar per min from the substrate. Equal amounts of protein were added to each reaction and the highest enzymatic activity towards a substrate for each crude enzyme extract from each subclone was used as benchmark of 100% activity. Sodium dodecyl sulfate polyacrylamide gel electrophoresis (SDS-PAGE) was performed according to the method of Laemmli. Native PAGE was carried out similarly with the exclusion of SDS from all solutions. For zymogram analysis of endoglucanases, the gel was placed on a fresh 1% agar plate containing 0.2% (w/v) CMC, and the covered plate was incubated at 37°C for 1 h followed by staining and destaining with Congo Red as described above for library screening. The endoglucanase gene harboured in BAC clone 14b22 (subclone p13), designated Cel14b22, was amplified by polymerase chain reaction (PCR) with the primers 5' GGAAGATCTTATGAAGAAAATTCTACT -3' (forward) and 5'- CCGGAATTCTTATTTCATAACGTATT -3' (reverse). PCR product was digested with Bgl II and EcoR I and ligated into the expression vector pET-30a (+) for expression of the recombinant protein with an N-terminal 6-His tag. The resulting expression construct was transformed into Escherichia coli BL21(DE3) and positive clones were selected on plates containing kanamycin. Cells were grown in LB broth containing 25 mg/mL of kanamycin at 37°C with shaking at 200 rpm and protein expression was induced with 1 mM IPTG (final concentration) when an optical density (600 nm) of 0.6 was reached. Protein expression was carried out at room temperature for 3–5 h. Cells were harvested by centrifugation (5000 × g, 15 min), resuspended in lysis buffer (0.05 M NaH2PO4; pH 8.0, 0.300 M NaCl, 0.02 M imidazole) and lysed by sonication. Cell debris were pelleted by centrifugation (30 000 × g for 30 min) and the supernatant was loaded onto a 2 mL Ni-NTA (nickel-nitrilotriacetic acid) column. The imidazole concentration was increased to 0.04 M and the resin was washed with 10 mL of buffer. Protein was eluted by increasing the imidazole to 0.25 M in the final wash. The final purified protein solution was desalted using a PD-10 ultrafiltration column (GE Healthcare, Mississauga, ON, Canada) by gravity flow according to the manufacturer’s directions and eluted with 0.05 M citrate-phosphate buffer, pH 6.0. Protein concentration was determined using a Quick Start Bradford Protein Assay kit (Bio-Rad, Mississauga, ON, Canada). Cellulase activity was measured by incubating 0.7 μg of recombinant Cel14b22 with 1% CMC in 0.5 mL 0.1 M citrate phosphate buffer, pH 6.0, at 50°C for 15 min. Optimal pH and temperature were determined as described above. Substrate specificities of the enzyme and the effect of several metal chloride salts at 10 mM (Ca, Co, Cr, Cu, Fe, K, Mg, Mn, Na, Zn), a chelating agent (EDTA) at 1 mM, and the detergent SDS at 1% (w/v) were investigated at optimal pH (6.0) and temperature (50°C). The pH stability was determined by measuring residual cellulase activity after the enzyme was incubated at 4°C for 24 h at the test pH. 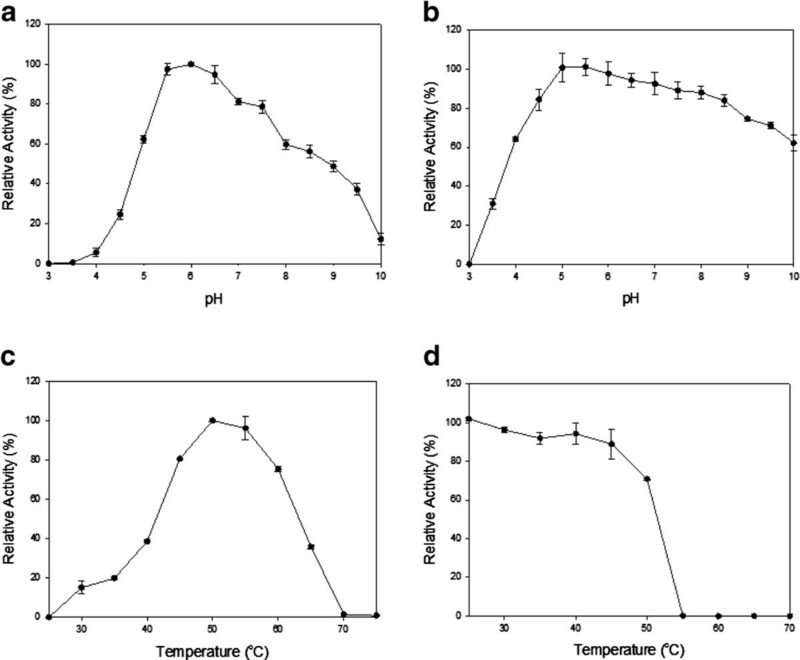 Thermal stability data were compared after incubating the enzyme at various temperatures from 30 to 70°C for 1 h, and measuring the residual cellulase activity. The kinetic constants, Km and Vmax, were calculated by directly fitting the data to the Michaelis–Menten equation by nonlinear regression. Reactions were carried out under optimal condition with CMC of different concentrations, ranging from 5 to 35 mg/mL. This work was conducted under the research fund from the Agricultural Bioproducts Initiative Program (ABIP) Cellulosic Biofuels Network (CBioN) of Agriculture and Agri-Food Canada and the Genozymes project with funding from Genome Alberta. The authors gratefully thank L. L. You and Krysty Munns for technical support. XG carried out functional screening and characterized the enzymes. LP isolated metagenomic DNA and constructed the BAC library. RG and SQ analysed data and wrote the manuscript. RF, TM, RT conceived of the study and participated in its design and coordination and helped to draft the manuscript. All authors read and approved the final manuscript.